In 1763, when England’s King George III began forcing his authority over the American Colonies in an effort to make them share the cost of the Seven Year’s War England had just won against France, colonists protested, invoking their rights as free men and loyal subjects. Using the thirteenth-century English document the Magna Carta as their bases that no one is above the law, including the King, colonists began a ten year struggle to defend their rights, which eventually led to the American Revolution. During the revolution that started in 1774, the only governing body representing the thirteen colonies was known as Congress. At their beginning they had no power to regulate commerce or lay taxes, and had little ability to enforce any of their decisions, but it would be this group that would declare independence and create a new political entity that would become the United States of America. Fifty-four men made up the First Continental Congress, which represented the various interests, religions and conflicting opinions of the colonists. This group of men, despite not knowing each other and with no history of successful cooperation, overcame their differences and started down the road to separation from England. In June of 1776, as the largest invasion force in British Military history was headed for New York Harbor, Thomas Jefferson was busy composing a draft of the Declaration of Independence. This declaration announced the separation of the thirteen colonies from Great Britain and the establishment of the United States of America, explaining the causes in a long list of charges against King George III. At the time, Jefferson wasn’t writing anything original, but simply articulating the ideals of the Revolution, beliefs in liberty, and the right to self-determination. American’s embraced a view of the world in which a persons position was determined not by birth, rank or title, but by talent, ability, and enterprise. That wildly held view had already started circulating in newspapers, pamphlets, sermons and schoolbooks, but it was Jefferson who would put the immortal words to it that have inspired downtrodden people throughout the world to rise up against their oppressors. 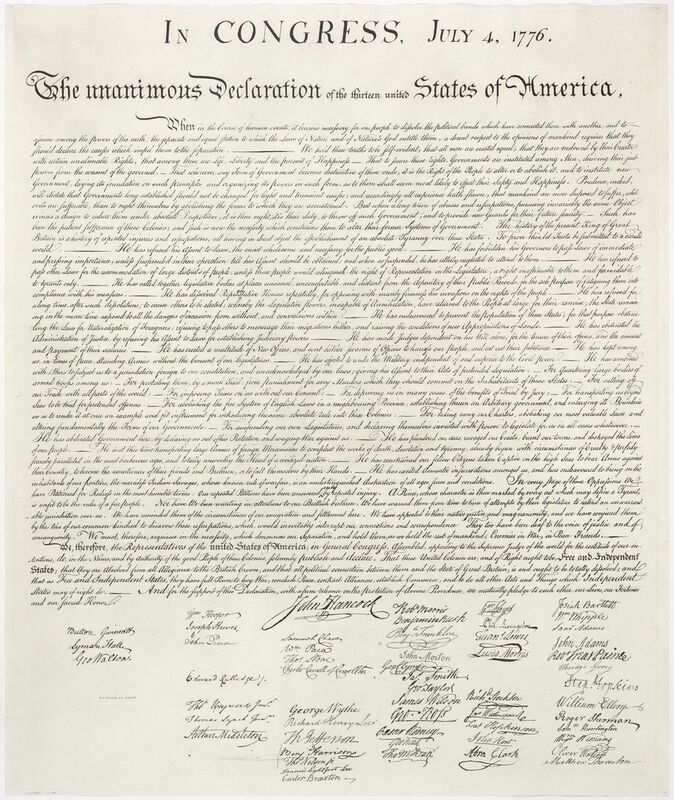 On July 2, 1776, Congress voted to declare independence from Great Britain, and then on July 4th they completed editing of Jefferson’s document, reducing a quarter of its text, and formally adopted the Declaration, thus throwing off the British monarchy from power. Though approved and adopted, the document wouldn’t be signed until August 2, 1776. 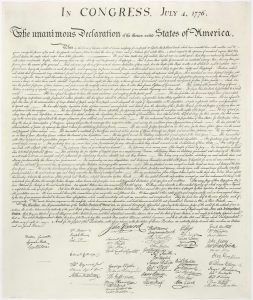 Here is the full text of the United States Declaration of Independence.